Although the world was in turmoil during the ‘40s, people did still get married! In fact, so many people did that the Baby Boom exploded after the war. However, 1940s weddings were not as formal as they were before or after the decade. Most weddings were during a 10-1pm brunch time, with a light meal and cake served after the church ceremony. 1940s wedding dresses and groom attire varied from business dress to very formal attire. Quite often the bride, groom and wedding party would all simply wear their best suits and dresses. Some brides choose to make a new dress for the occasion with a color and design that would make it wearable again after the wedding. Rose pink was a popular choice for both brides and bridesmaids. While silk and satin were unavailable during the war lace and tulle were not rationed, although still very expensive. In the USA rayon satin, crepe and taffeta were made available for sale as a way to boost moral during the tough times. After the war white silk parachutes were released for sale back to the public and quickly became choice materials for 1940s wedding dresses and bridal lingerie. 1945 wedding wearing a dress worn in 1928! Groom in a morning suit. Wearing their mothers wedding dress or other close friend or family member was another popular option. Many used the old wedding dress to create a new design or if they liked it wore it as is. In some larger cities renting a wedding dress was an option too. The shortage of wedding dresses was especially felt in the UK where it wasn’t uncommon for dresses to be brought over from the USA and then worn at least by a dozen bride friends during the year. If the bride was a uniformed servicewoman she would probably wear her best uniform since they were not given civilian rationing stamps to purchase wedding clothes. Another wedding couple. Was this ruched dress with tulle skirt is a late 1940s design. For those who could afford to make or buy a 1940s wedding dress the styles were similar to day dresses. They always had long sleeves and full skirts, but the ‘princess’ look was not achievable with the fabric restrictions. Dresses usually had a sweetheart neckline and fitted bodice with fitted sleeves that were gathered or puffed at the shoulder. From the waist, a circle skirt fell to the floor . Long trains were a waste of fabric but shorter trains were still allowed. Dresses were also pretty plain, missing any intricate embroidery or beading. The decoration went to the veil and headpiece. Brides always wore a long single layer net veil, often attached to a little pillbox hat pinned to the head. A headband of seasonal flowers was another popular piece, with or without a veil. Headband flowers matched the bride and groom’s corsage and the bride’s very large bouquet. Common flowers were pink or white carnations, gladiolas, roses and real or fake greenery such as silk leaves. Orchids were popular corsage flowers. A white pearl necklace was the sole piece of jewelry worn by nearly every bride in the 1940s. 1940s bridesmaid dress made of flocked net in yellow, blue. pink, grey. Bridesmaids, if dressing up, would wear similar dresses to the bride. They often had short sleeves instead of long, and their dresses were of course not white. They would be a light shade of blue, green, pink, yellow or a pretty floral print. Bridesmaids often wore shorter veils, hats and flowers in their hair. They carried bouquets as grand as the bride’s. Shop 1940s style bridesmaid dresses. Flower girls were an optional wedding party member. They too wore dresses similar to brides and bridesmaids with floor length puffy skirts. They did not always match the bridesmaids. Page boys were dressed like groomsmen- usually in formal suits or velvet knickers. Shirley Temple and John Agar at their Wedding Reception, September 19th, 1945. 1940s Wedding Clothes– For a 1940s inspired wedding look here for dresses, veils, shoes and accessories. For bridesmaid or mother of the bride dresses look here. The 1940s groom and groomsmen’s attire varied greatly during the 1940s. 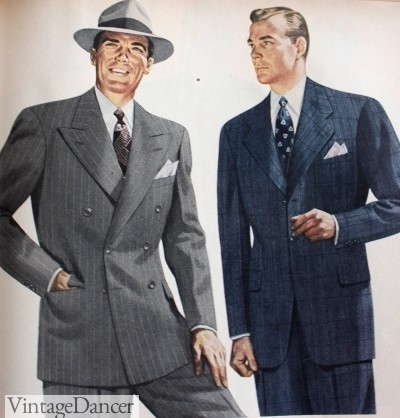 In the early year or when funds were short men would wear their best suits- usually dark colors and double breasted. A single breasted suit would be fine if that’s is all he had. The suit was usually worn with a white button down dress shirt and colorful tie. Black oxfords were the preferred shoe with most suits. Two tone shoes were not worn- they were much to casual for a formal affair. If a groom wore a suit so did the groomsmen and fathers. There was little difference between the men. All male members wore a corsage pinned to the lapel. They were often white or yellow carnations or flowers matching the bride’s bouquet. Service men wore uniforms during and after the war. They were usually the nicest clothing a man owned. Morning suits were traditional men’s business and special event ettire. In the 1940s, they were hardly worn except at formal weddings. Morning suits included a grey or black cutaway coat (morning coat), grey and black striped pants, white wingtip collar dress shirt, ascot in silver grey or black with pearl stickpin, grey waistcoat, grey gloves, white carnation, white pocket square, black socks and black patent leather dress shoes. A black silk top hat complete this traditional look. In some cases an ascot was replaced by a standard black necktie. Tuxedo attire was the other, more common, formal style. Black tailcoat, white vest, white wingtip dress shirt, white bow tie, black pants with a satin stripe, white gloves, black patent leather shoes and an optional black silk top hat. Black Dinner Jacket– Peak lapel or shawl collar single or double breasted jacket. White wingtip dress shirt, black or white shawl collar vest, black satin stripe pants, black bow tie, white pocket square. No hat, gloves, or dress shoes required. White Dinner Jacket– An alternative to black, especially in summer, was the white dinner jacket worn with cummerbund instead of vest. It was much cooler to wear. The early ’40s also saw the ivory pant with dark blue dinner jacket being worn. What about male wedding guests? Read this article for ideas on what to wear. Wow! Very interesting post, love all the pictures, thank you.